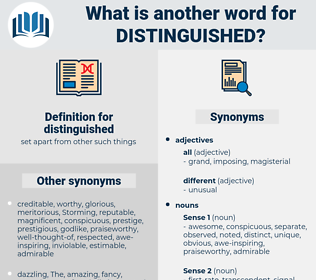 What is another word for distinguished? different, conspicuous, glittering, recognised, well-deserved, estimated, separate, world-renowned, noticeable, high-gloss, identifiable, marked, Seconded, acknowledged, world-famous, recognized, first-class. Excellencies, attachments, fellas, members, Mesdames. Discriminated, Differed, characterized, classified, Investigated, characterised, Discussed, considered, studied, Examined, Stood, Explored, Typified, Were, reviewed, Looked, discriminate, recognized. Discerned, Discriminated, identified, Differed, Disassociated, difference, designated, characterized, disaggregated, categorized, assigned, adjusted, Indicated, defined, delineated, classified, disqualified, established, Discounted, distributed, dispatched, divided, Excluded, dismissed, described, Explained, Compared, demarcated, dispersed, Translated, characterised, highlighted, located, categorised, perceived, demonstrated, recognisable, disclosed, separated, Displayed, discarded, confused, Eliminated, outlined, specified, Mentioned, considered, emphasised, labeled, labelled, removed, varying, clarified, Enshrined, underlined, subdivided, attached, reflected, Avoided, apportioned, Emerged, found, surrounded, HIT, reported, Quoted, learned, underscored, shaped, emphasized, arranged, recorded, treated, nominated, printed, Influenced, Cited, drawn, granted, revealed, imposed, enforced, pointed, valued, held, Precluded, noticed, inspired, rejected, appointed, signalled, Stationed, associated, Averted, variance, dominated, stressed, esteemed, Typified, allocated, affected, graded, Shown, witnessed, listed, graduated, Enjoyed, changed, credited, mixed, tagged, Compiled, Punctuated, Counted, accompanied, grouped, Been, referenced, scattered, Afforded, ranked, charged, Filed, Deployed, impacted, beset, opened, spread, Awarded, prepared, Contemplated, Referred, sorted, Waived, Classed, Prorated, shared, accrued, Excelled, divorced, Flagged, posted, Carried, placed, priced, plagued, marred, Singled, seen, Accorded, Taxed, driven, Scored, structured, raised, Accounted, completed, loved, booked, linked, made, named, conspicuous, recognised, estimated, marked, Seconded, acknowledged, Deemed, recognized. esteemed, illustrious, prestigious, distinct, distinguishable, differentiated, brilliant, pre-eminent, privileged, distinctive, dignified, outstanding, reputable, characteristic, emeritus, eminent, high-profile, bright, discriminate, preeminent, great, respectable, sterling, segregated, distinguishing, salient, noteworthy, discrete, splendid, significant, Famed, magnificent, high-ranking, celebrated, accomplished, wonderful, lofty, gloss, shiny, solemn, superb, striking, influential, glossy, acclaimed, prominent, tremendous, flagship, authoritative, meritorious, august, considerable, revered, high-level, high, fine, notorious, commendable, worthy, exemplary, Deemed, creditable, honourable, exceptional, stellar, world-class, landmark, merit, rich. distinctive, distinction, outstanding, emeritus, eminent, distinguishing, prominent, meritorious, exemplary, honourable, exceptional. identified, esteemed, differentiated, distinction, marked. lowly, unremarkable, infamous, normal, common, stupid, unrespected, typical, unimportant, obscure, ordinary, undignified, insignificant, unextraordinary, standard, unknown, unimpressive. uncouth, improper, crude, flighty, giddy, vulgar, unseemly, goofy, inferior, average, coarse, crass, silly, indecent. I don't know which name is the most distinguished, that of the English bishop or the German baron. Then you know also the distinguished exception I make of you.